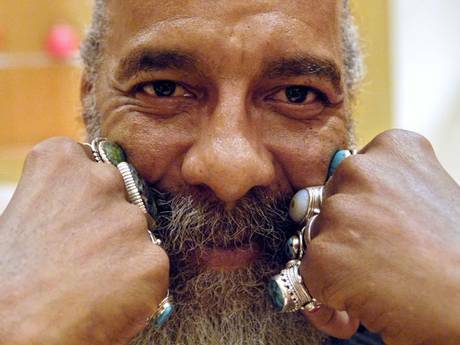 The legendary folk guitarist Richie Havens died yesterday at 72 of a sudden heart attack. Havens was thrust into fame at Woodstock, where he served as an impromptu opening act when the scheduled opener was stuck in traffic. After running out of songs to play, he just started chanting “Freedom” over his percussive guitar strumming with such gravitas and urgency, that it is still one of the festival’s defining moments. Imposingly tall, yet gentle and lean, he played with African rhythmic sensibilities that added soulful authenticity to the otherwise lilywhite sixties American folk music landscape. He toured and collaborated with Bob Dylan and recorded several Dylan covers over the decades, including a train-gallop version of “Tombstone Blues” for the 2007 Todd Haynes‘ Dylan biopic I’m Not There. But it was his cover of George Harrison’s “Here Comes the Sun” that gave him his biggest hit. In this humble opinion, it is the greatest Beatles cover ever recorded — true to the original but with soaring rhythmic dimension that allow listeners to hear the classic anew. The hit was recorded in front of a live audience at Washington’s Cellar Door. His performance at the 2010 Newport Folk Festival was like a communion with a higher spiritual plane of existence. In related news, Christina Amphlett, the lead singer of Australian New Wavers Divinyls, died over the weekend of complications from MS and breast cancer. She was only 53. You may remember their classic “I Touch Myself” from 1991, but the band had by then already amassed a large following.